"To the glory of God and in affectionate remembrance of the soldiers belonging to this parish who died for their country in the war in S. Africa 1899-1902. Private Thomas Henry Bushell, 18th Hussars, killed at Talana Hill 20th October, 1899, aged 25. Sergeant Thomas Davis, 1st Battn Royal Berks Regt, died of fever at Frankfort 6th July 1900 aged 29. Their parents and the parishoners of Theale place this tablet in their Parish Church." 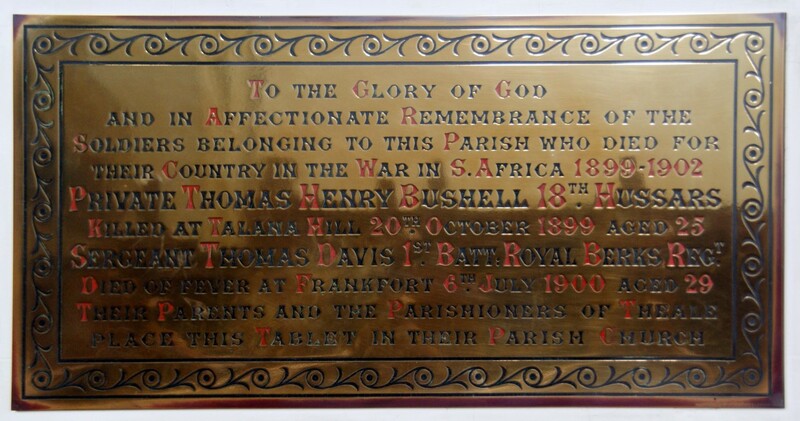 A handsome brass tablet, bearing the following inscription, has been placed in Holy Trinity Parish Church: "To the glory of God and in affectionate remembrance of the soldiers belonging to this parish who died for their country in the war in S. Africa 1899-1902. Private Thomas Henry Bushell, 18th Hussars, killed at Talana Hill 20th October, 1899, aged 25. Sergeant Thomas Davis, 1st Battn Royal Berks Regt, died of fever at Frankfort 6th July 1900 aged 29. Their parents and the parishoners of Theale place this tablet in their Parish Church." In his sermon on Sunday morning in connection with this society, the Rev S C F Angel-Smith, rector, compared the work of the church at home and abroad to citizens who stay at home and those who go forth to fight her battles in other countries. In referring to the memorial tablet, he said it was at once an ornament to their parish church, a record of the part their village took in the great crisis of our national history, and a proof of their affectionate remembrance of the two young heroes who went forth to fight and died for England.